The Leto Hotel is conveniently located in the center of Mykonos, and offers first class services, facilities and amenities. The property was completely renovated and redecorated in 1997. The Leto Hotel is built in the neo-classical style and consists of 25 tastefully furnished rooms all of which have a balcony overlooking the port of Mykonos and the enchanting Aegean Sea beyond. The panoramic views and breathtaking sunsets are exceptional. The Leto hotel consists of one main building, which is air-conditioned throughout, a large and spacious lobby and a reception area. Air conditioning, direct dial telephone, fully stocked mini bar, safety deposit box, satellite color TV, music channels, hair dryer and bathtubs in all the bathrooms. Other services and facilities, which are available at the Leto hotel include: an exchange desk, baby sitting services upon request, a full service travel desk, daily mail collection, transfer services, laundry services and room services. The Leto hotel has an outstanding restaurant, which serves a full American buffet breakfast and is renown for it’s excellent cuisine and services both during lunch and dinner. The professional multi-lingual staff will ensure that your stay is carefree with courteous and friendly service. The Leto Hotel is surrounded by an impressive garden, ideal to stroll through and relax. 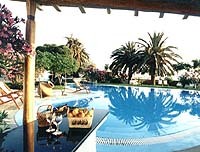 Alternatively, the swimming pool with its pool bar is the perfect place to unwind.